This morning in metals news, U.S. copper deposits are garnering investment from electric vehicle (EV) industry players, London copper rose Friday and the E.U. mulls retaliation if the U.S. imposes tariffs on automobiles. The copper price struggled through the final quarter of 2018, but according to a Reuters report the metal could be getting a boost in demand from the EV sector. According to the report, U.S. copper deposits have received $1.1 billion in investments from miners looking to fill demand from EV makers. Sticking with the metal, the London copper price moved up Friday but was set to take a weekly loss, according to Reuters. The projected 1.6% weekly drop would mark the biggest weekly decline since late December, according to the report. Last August, the U.S. Department of Commerce launched a Section 232 probe investigating whether imports of automobiles and automotive parts pose a national security threat. While the Commerce Department has yet to take action — the first step being the submission of a report and recommendations to President Donald Trump — the E.U. has promised to respond if the U.S. opts to impose tariffs. According to a report by Fortune, the E.U. this week said it is prepared to impose $23 billion in tariffs on U.S. goods if the U.S. imposes tariffs on automobiles. The Commerce Department launched the Section 232 automotive probe May 23, 2018. Pursuant to Section 232 of the Trade Expansion Act of 1962, the secretary of commerce must present the president with a report, including recommendations, within 270 days of the initiation of the probe (making for a late February deadline in this case). Section 232 produced the Trump administration’s tariffs on imported steel and aluminum (25% and 10%, respectively). Prior to the Trump administration, Section 232 was last invoked under President George W. Bush in a 2001 probe that investigated the impact of imports of iron ore and semi-finished steel. Even if U.S. steelmakers have been slow to add capacity following President Trump’s tariff protection, it would seem foreign steel makers are willing to commit to domestic U.S. production. The Financial Times this week reported on the announcement by BlueScope Steel, Australia’s biggest steelmaker, to examine adding 600,000 to 900,000 metric tons per year of steelmaking capacity to its North Star business in Ohio. This would raise the Ohio plant’s existing production of 2.1 million metric tons per year to some 3 million tons at a cost of between U.S. $500 million and $700 million. The project would involve the addition of a third electric arc furnace and a second slab caster, according to the Financial Times report. A decision is expected at the company’s February 2019 annual results pending the outcome of the feasibility study, by which time a clearer picture may emerge of what the tariff landscape is going to look like longer term. Interestingly, Australian steelmakers are exempted from the tariffs; in theory, BlueScope could have invested at home. Australia, however, along with Argentina, are subject to quota limits, so ramping up domestic production to meet U.S. demand is not considered a viable option. According to the Financial Times, domestic U.S. steel producers are, not surprisingly, doing rather well from the tariffs. The resulting price rises have fueled a rally in U.S. domestic prices, helping firms like ArcelorMittal surpass forecasts previously set by analysts. Arcelor’s earnings came in at $5.59 billion before interest, taxes, depreciation and amortization for H1 2018. That represented an increase of 28.6% on the same period a year before, as half-year sales rose 17.6% year-on-year in value terms to $39.2 billion, primarily due to higher steel selling prices. Net income was up by almost one-third to $3.06 billion. It hasn’t yet resulted in Arcelor announcing any increased investment in domestic U.S. production capacity — the real aim of the tariffs — but, arguably, steelmakers are waiting to see how the whole tariff situation develops and whether they are truly here to stay (in which case, investment could result). The U.S. Department of Commerce found foreign steel accounted for about one-third of the 107 million metric tons of steel the U.S. economy used in 2017, the Weekly Standard reported. Although U.S. producers still have a commanding market share, the report concluded that inexpensive foreign imports were causing domestic steelmakers to lose money, lay off workers, and close plants last year. Well, that was last year; this year is something very different. Following tariffs, steel prices are up sharply, profits are up at the domestic mills and so is capacity utilization. The domestic mills have the option to price balance towards full capacity, shielded as they are now behind a 25% import tariff. They may choose to take higher prices and forego full capacity or adjust pricing to achieve full capacity; we will see what policy has been adopted when Q3 and H2 figures are released. It is unlikely significant new capacity will be added in the short term, though, despite talk of planned new capacity. According to Reuters, steel output in the United States rose 2.9% in the first half to 41.9 million metric tons and gained 0.8% in June to hit 6.9 million tons for the month. 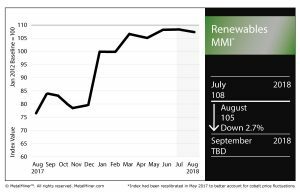 Data from the American Iron and Steel Institute (AISI) show capacity utilization at U.S. mills in the year to July was 76.4%, up from 74.4% in 2017, suggesting domestic mills generally are opting for better prices as a route to profitability rather than pricing out tariffed imports. 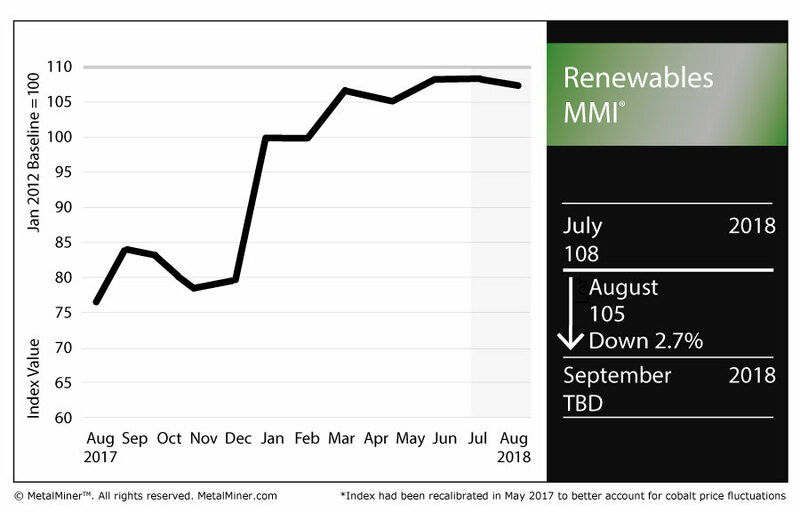 The Renewables Monthly Metals Index (MMI) dropped three points for an August MMI reading of 105. Miner BHP Billiton has plans to ramp up its production of a cobalt product used in electric vehicle (EV) batteries, Bloomberg reported. Per the report, the miner has had success in producing cobalt sulphate alongside its nickel product at its Western Australia operation, according to an interview with Asset President Eduard Haegel. Questions about cobalt supply and price volatility persist, but a miner of the size of BHP looking to expand its presence in the sphere is an indicator of the metal’s importance and, thus, the level to which the EV market is coveted. The price of the coveted metal has come off a bit of late, but that might just be a short-term blip. According to the Toronto-based Sherritt International Corp — a miner with operations in Cuba, Madagascar and Canada — the softening of cobalt prices should reverse as demand continues to pick up, particularly vis-a-vis the growing EV sector, Reuters reported. According to a report in the Hellenic Shipping News, shipbuilders in South Korea are asking steelmakers to freeze shipbuilding plate prices. According to the report, the Korea Offshore & Shipbuilding Association is asking for the freeze because price hikes threaten their survival, as declining orders and increased competition from China have weighed on the Korean shipbuilding sector. Thick steel plate prices jumped $44/ton in the first half of the year, according to the report. Japanese steel plate fell 1.0% month over month to $715.62/mt. Korean steel plate rose 1.6% to $682.89/mt. Chinese steel plate fell 4.4% to $707.51/mt. U.S. steel plate jumped 5.2% to $986/st. Chinese neodymium fell 4.0% to $60,182/mt. 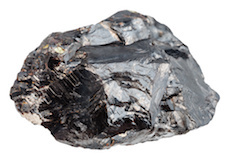 Chinese silicon fell 2.8% to $1,511.89/mt. Chinese cobalt cathodes fell 2.8% to $97,612.20/mt. This morning in metals, a Chinese province announced new capacity cut targets as part of the country’s overall environmental plans, copper supply-side issues and Vedanta’s quarterly earnings rise. China’s Shandong province has new targets for cuts on steel and coal production, Reuters reported. The plans include cuts to pig iron production capacity of 600,000 tons and crude steel of 3.55 million tons by the end of this year, according to the report. The copper price has been in a downtrend of late. 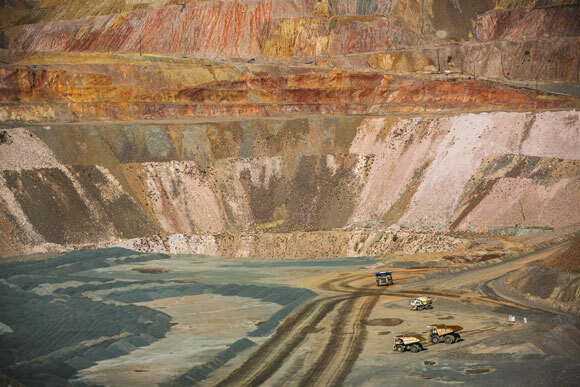 While it remains to be seen if the downtrend will become a long-term slide, copper watchers are also paying attention to supply-side issues at Freeport-McMoRan’s Grasberg mine in Indonesia. According to Bloomberg, the mine will see production cut by 300,000 metric tons next year as the miner transitions open pits to underground operations. 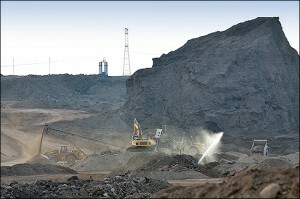 Indian miner Vedanta Resources reported a rise in quarterly earnings, Reuters reported. For the three-month period ending June 30, the miner reported EBITDA of $983 million, up from $778 million for the same period in 2017, according to the report. 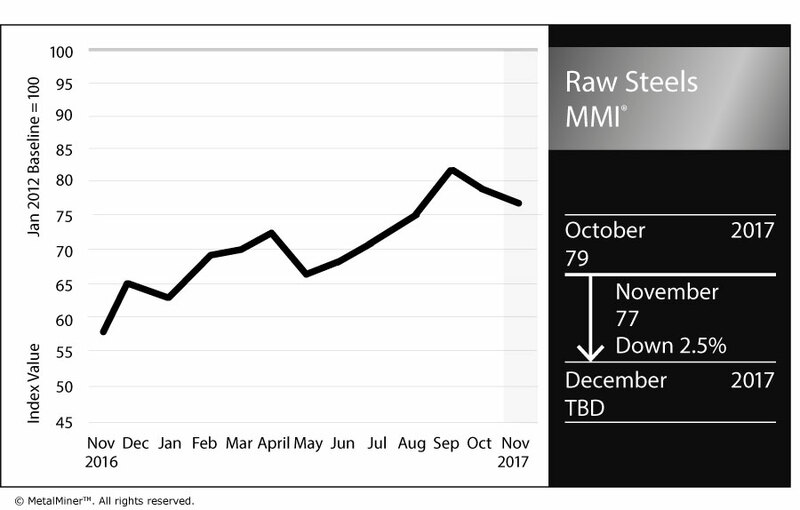 The Raw Steels MMI decreased again this month, falling two points down to 77. Steel prices seem to have lost momentum and fell this month both domestically and internationally. However, mills have announced price hikes for November. Prices in October fell for all forms of steel, although HRC and plate prices increased slightly at the end of the month. However, historical Q4 price trends generally suggest rising prices and increasing demand. In addition, industrial metals remain solidly in a bull market. Will steel prices see a bump too? Let’s take a look at the market indicators. Domestic steel prices fell this month after trading flat (sideways) for the last few months. Steel price momentum has declined but Q4 increases often come in November and later. Service centers still report steady demand, despite significant steel price drops in October. Lead times increased for all forms of steel. Increasing lead times generally support rising steel prices. Curtailed Chinese capacity has supported steel prices during most of the year (particularly during Q3). However, no real shortage exists, as China increased production in the summer to meet heavier winter demand. In October, the Chinese Steel PMI fell to a 6-month low, though it remains above 50, which still signals growth. During the first few days of November, Chinese CRC prices held steady while HRC prices fell slightly. As HRC and CRC prices commonly move in tandem, prices will likely adjust during the month. Buying organizations should watch Chinese prices for signals of a price rebound. Scrap prices fell together with steel prices this month. Scrap prices held somewhat steady during 2017 (as have steel prices). Raw material price dynamics tend to correlate with steel prices. 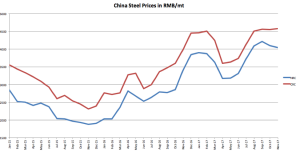 Steel prices decreased in October, following iron ore’s September price falls. Coal prices traded sideways in October, despite the short-term uptrend that began in April. Early November iron ore prices appear flat, while coal prices increased to the $100 level. 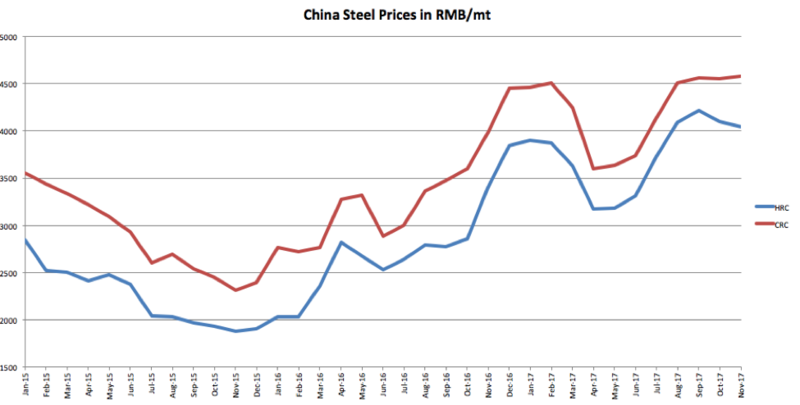 Increasing raw material prices may create some upward movement for steel prices. Steel price dynamics continued to lose momentum this month. 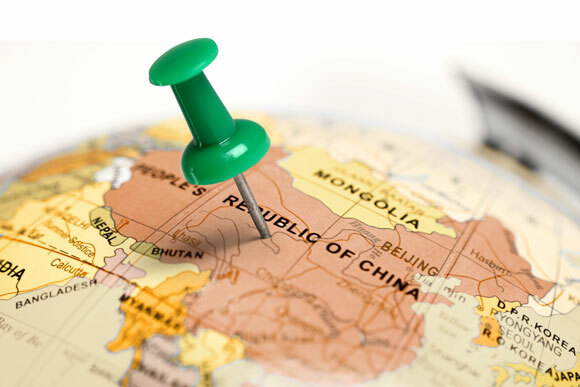 However, buying organizations will want to pay close attention to Chinese price trends, lead times and whether domestic mill price hikes stick. To read more about our longer term steel price trends download our free Annual Outlook. To understand how to adapt your buying strategy this season, take a free trial now or subscribe to the Monthly Outlook for a short-term analysis. 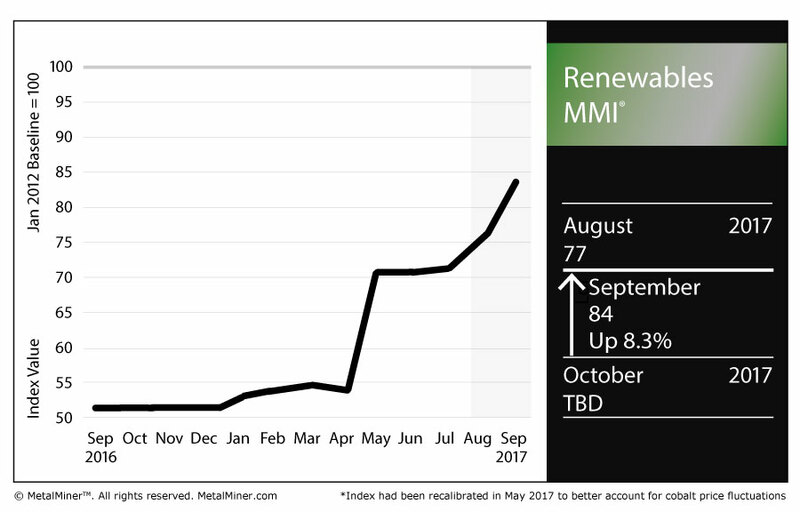 The Renewables MMI rose seven points in August, reaching a reading of 84. The basket of metals in this sub-index posted a strong month. Steel plate from Japan, Korea and China rose in the month. U.S. steel plate, however, fell 4.6%. Meanwhile, in the topsy-turvy world of grain-oriented electrical steel (GOES), the U.S. GOES price jumped 7.3%. Of the nine metals in the sub-index, only one (U.S. steel plate) posted a drop in price as of Sept. 1. Chinese silicon, cobalt and neodymium all also posted price gains. Last month, we wrote about cobalt, which is in high demand for its application in electric vehicle batteries. Cobalt is mined predominantly in the Democratic Republic of Congo, which has been shaken by violence and political instability this year. The instability there has seen production in the DRC decrease this year, yielding significant price increases in the metal. As we wrote last month, the instability of cobalt (not to mention growing ethical concerns vis-a-vis child labor at mines) has some battery makers looking to adjust their metal formulas, in some cases suggesting the use of more nickel, instead. According to a Reuters report, however, cobalt has been boosted by projections touting a rise in purchases of electric vehicles. According to the report, UBS forecasted electric vehicles will account for 3.1% of global car sales in 2021 and 13.7% in 2025, up from 1% this year. In addition, cobalt listings have skyrocketed, the report says. As of the end of July, 100 companies that explore or mine for cobalt were listed on the Toronto Stock Exchange and TSX Venture Exchange, up from fewer than 30 in 2015, according to SNL Financial. 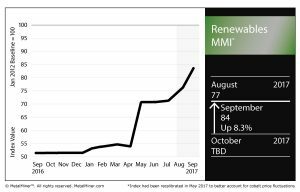 In short, despite issues of supply volatility — and, thus, material cost — cobalt’s profile continues to rise in tandem with the rise of electric vehicles. What About U.S. Steel Plate? Like the rest of the U.S. steel industry, steel plate producers are anxiously awaiting the Trump administration’s determination in its Section 232 investigation of steel imports. The investigation, announced in April, has a January deadline. The investigation picked up steam earlier on in the summer, but has seemingly been put on the backburner for the time being. As such, initial optimism from U.S. steel producers regarding potentially imminent trade action stemming from the investigation began to wane. In a letter to the Trump administration last week, the American Line Pipe Producers Association (ALPPA) urged the president to take action, also mentioning steel plate in the process. “The ALPPA strongly supports the imposition of tariffs to address this crisis,” wrote Timothy Brightbill, counsel to the ALPPA. “With tariffs in place, we could quickly return to full capacity, adding hundreds of direct jobs in addition to upstream and downstream jobs as well. Steel Market Update’s 2017 Steel Summit kicked off in Atlanta this week and the topic on everyone’s minds was Hurricane Harvey and the far-reaching impact it will have on the Houston region. 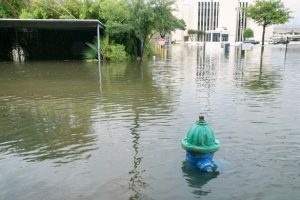 The humanitarian impact of Harvey cannot be overstated, but the economic impact on Houston, an industrial hub in the southern United States, will be felt in both the short- and long-term, with freight transportation at a virtual standstill (Port Houston operations resumed today, according to an alert on the Port Houston website). According to SMU, FTR Transportation Intelligence reports up to 10% of U.S. truck capacity will be disrupted in the next two weeks. In response to fuel supply disruptions from Hurricane Harvey, average national gasoline prices grew to $2.37 per gallon earlier this week, and continued to surge to $2.51 Friday morning, according to the AAA website. How will steel and base metals fare in 2017? You can find a more in-depth steel price forecast and outlook in our brand-new Monthly Metal Buying Outlook report. 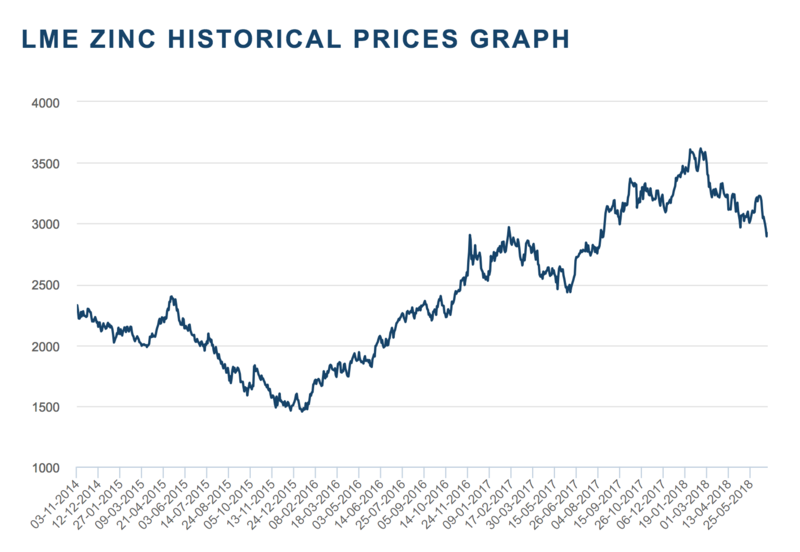 Nickel prices maintained near nine-month highs mid-week, due in part to Chinese stainless steel mill demand and decreased supplies from the Philippines, a top exporter of ore. According to a report from Reuters, nickel prices peaked earlier in the week to $11,885 a ton, its highest point since November 2016. 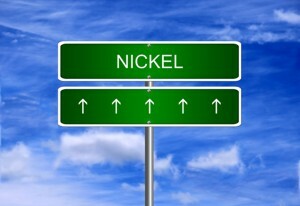 Year-over-year, nickel prices are up more than 15%. “Stainless steel demand in China and elsewhere has surprised on the upside and talk about nickel consumption in lithium-ion batteries has helped,” Societe Generale analyst Robin Bhar told the news source. 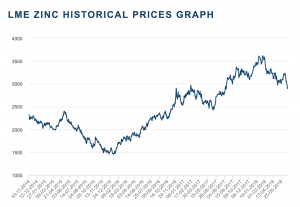 Our own Irene Martinez Canorea recently wrote that nickel, along with tin and lead, are more reticent to join the bull rush with aluminum, copper and zinc. The International Lead and Zinc Study Group (ILZSG) released its August report, which found the global market for refined zinc metal was in deficit during the first half of the year. Total reported inventories declined over that time, as well. Global production from zinc mines grew 5.4% compared to the first half of last year, mostly due to a boost in output from Peru, India and Eritrea. Furthermore, zinc production suffered in places like Canada, Thailand, Peru and the Republic of Korea, leading to an overall worldwide increase of just 0.5% after factoring in growth in places like France, Brazil and India. Our own Fouad Egbaria wrote just last week that zinc has really hit its stride, recently hitting its highest price point in more than a decade ($3,180.50). How will zinc and base metals fare in 2017? You can find a more in-depth zinc price forecast and outlook in our brand-new Monthly Metal Buying Outlook report.